A familiarity with musculoskeletal disorders is vital for medical school graduates. The purpose of this study was to investigate perceived deficiencies in undergraduate education to provide motivation for a restructuring of the curriculum. A basic competency examination in musculoskeletal medicine was used. Group 1 comprised 79 interns in their first postgraduate year. The recommended passing score for the examination was 73.1%. The score for the interns in Group 1 was 45.3%. Seventy-two (91%) of the 79 interns failed to demonstrate basic competency. The examination was reapplied to 53 interns (Group 2), to establish whether a two-month orthopaedic rotation during internship improved performance. The score for the group was 56.8%. 85.7% (18/21) of those who had completed an orthopaedic rotation and 93.8% (30/32) of those who had not completed an orthopaedic rotation failed the assessment. The additional exposure to musculoskeletal medicine during internship did not show statistical benefit (95% CI 58.0-79.5). In summary, 91% of medical-school graduates failed a basic competency examination, and no benefit was found from completing an internship rotation. We believe that undergraduate musculoskeletal education in South Africa is inadequate and that programmes throughout the country should be reassessed. Keywords: Musculoskeletal education, undergraduate curriculum, basic competency examination, orthopaedic. Musculoskeletal symptoms account for a quarter of primary care and accident and emergency attendances internationally, and approximately two-thirds of people on long-term sick leave in Europe claim a musculoskeletal problem as the reason.1,2 The economic burden of musculoskeletal illness accounts for 2.5-7.7% of the gross national product of many nations.3 An audit from Durban in South Africa found that 63% of orthopaedic operations performed in 2009 were as a direct result of assaults, gunshots or motor vehicle accidents (MVAs).4 In 2001, injuries killed 5.1 million people and accounted for 12% of disability-adjusted life years (DALYs) lost worldwide, which was more than that lost due to tuberculosis, diarrhoea and malaria combined.5 More alarming is a Ugandan study which found that for each person who dies from trauma, three to eight more are permanently disabled.6 In South Africa, DALYs lost due to injury is ranked third behind HIV/AIDS and infectious/parasitic illnesses, and above cardiovascular disease, respiratory disease, malignancies and diabetes mellitus.7 In 2000, musculoskeletal diseases accounted for the loss of more than 45 000 DALYs in South Africa.8 Furthermore, the impact of musculoskeletal conditions is predicted to increase dramatically with the ageing of the population, lifestyle changes resulting in a lack of physical fitness and obesity, and the increase in MVAs with the urbanisation and motorisation of the developing world. Many studies express concern that doctors lack the competency and skills to manage musculoskeletal disorders seen in daily practice. A survey of Ontario physicians found the unnecessary use of diagnostic tests, inappropriate prescriptions and lack of diagnostic suspicion of dangerous muscu-loskeletal conditions to be common problems.15 This inability to recognise common conditions, and a lack of understanding of the appropriate use of special investigations, results in ineffective usage of valuable resources. There are countless scenarios in orthopaedic surgery where innapropriate initial management can drastically increase the cost and complexity of definitive treatment. An Australian study found only 10% of medical inpatients undergo a musculoskeletal examination, despite 40% having musculoskeletal symptoms on admission.16 Jandial et al. from Newcastle University assessed confidence in paediatric musculoskeletal assessment.17 The majority of respondents had no confidence in the musculoskeletal assessment, while most respondents were very confident in the cardiovascular, respiratory and abdominal systems. Musculoskeletal assessment ranked lowest of all systems. In addition, only half of the respondents recalled any teaching of paediatric musculoskeletal medicine at undergraduate level. It would be considered negligent for a medical graduate to be incompetent at assessing the cardiovascular or respiratory system, yet it is common for students to leave medical school without being able to make an adequate assessment of the musculoskeletal system. We wanted to quantify this problem in a South African context. A basic competency examination in musculoskeletal medicine was applied to a group of recently graduated doctors (Figure 1).18 The assessment was reapplied two years later to evaluate whether the recently instituted two-year internship, with its complusory two-month Orthopaedic/Orthopaedic Trauma rotation, had any effect on competency in musculoskeletal medicine. We enrolled interns in their first postgraduate year in 2010 at Groote Schuur and Tygerberg Hospitals (Group 1) and asked them to complete the Freedman and Bernstein Musculoskeletal examination (Figure 1). The test was administered on the first day of each hospital's intern orientation programme. All 79 interns agreed to participate. The cohort included graduates from all eight South African medical schools. The examination was developed to test medical school graduates' understanding of basic musculoskeletal problems. It was validated by chairs of residency programmes in orthopaedic surgery and internal medicine. The pass mark was set at 73.1% by the 124 chairs of orthopaedic residency programmes, and 70% by the 240 chairs of internal medicine residency programmes. The examination consists of 25 short-answer questions. The questions were also weighted according to importance from 0 to 10 by the orthopaedic chairs. Topics included fractures and dislocations, back pain, arthritis, basic anatomical knowledge, and emergencies that require immediate referral to an orthopaedic surgeon. The examination was scored anonymously according to the validated answer key. In our study, the overall unweighted score was calculated as described in the original paper and the recommended pass mark set at 73.1%. As an additional test of validity, the examination was administered to all registrars in orthopaedic surgery at the University of Cape Town. The mean score for the 17 orthopaedic registrars was 96.0%, and that for the 79 interns in their first postgraduate year was 45.3% (8.0-77.0%, 95% CI 42.3-48.4) (Figure 2). Only seven interns (9%) had a score of more than 73.1 ± 6.8% and thus demonstrated basic competency in the examination. The scores for the individual questions ranged from as high as 92.3% to as low as 9.0%. To examine the hypothesis that the interns may have scored well on the most important questions and poorly on the least important questions, a weighted score was calculated. The overall weighted score for all interns was 47.0% (95% CI 43.9-50.1). Seventy-one (90%) of the 79 interns failed the examination when the questions were weighted according to their attributed importance. Anatomy-based questions (Q8, 10, 11, 12, 15, 20, 22, 23, 24, 25) were answered poorly, with an average score of 37.9% (95% CI 33.6-42.3), compared to the overall average score of 45.3%. 'Red flag' questions dealing with orthopaedic emergencies (Q2, 4, 5, 6, 7) were better answered, with an average score of 55.3% (95% CI 50.7-59.8). A pass mark was calculated using the Cohen method (70% of the 95th percentile).19 This was done to set a pass mark as a function of the performance of the top candidates so as to adjust for the difficulty of the examination. Fifty-six of the 79 interns (70.9%) failed the assessment according to the pass mark (53.9%) set by the Cohen method. In the follow-up study (Group 2) a response rate of 69.7% was achieved (53/76). Unweighted scores were calculated. The mean score for the group was 56.8%. Those who had completed an orthopaedic rotation during their internship (21/53) achieved an average score of 62.4% (35-83%), compared to 54.1% (20-80%) among those who had not yet completed an orthopaedic rotation (32/53). 85.7% (18/21, 95% CI 62.6-96.2) of those who had completed an orthopaedic rotation and 93.8% (30/32, 95% CI 77.8-98.9) of those who had not completed an orthopaedic rotation failed the assessment. The additional exposure to muscu-loskeletal medicine during an internship rotation did not show statistical benefit (95% CI 58.0-79.5). While our study population was too small to allow any statistically significant sub-analysis, we were able to demonstrate two trends, with the interns who scored higher in the assessment coming from programmes with more time allocated to orthopaedic training and from programmes that included on-call duties for the students. There are several limitations to this study. Freedman and Bernstein's musculoskeletal examination is the only validated assessment tool available. We used the pass mark of >73.1% established by 124 orthopaedic programme directors instead of that of >70% established by 240 internal medicine programme directors. Selecting the lower pass mark may have changed some of our findings. While the pass mark was validated by 124 programme directors, it is open to criticism. However, using the Cohen method, which uses the top performing students as a point of reference to set a pass mark that reflects the difficulty of the assessment, more than 70% of the interns still failed. Our study may have been limited by sample bias, with participants coming exclusively from two large tertiary hospitals in Cape Town. Our intern group did, however, include graduates from all eight South African medical schools. In the follow-up study the 69.7% response rate may have introduced selection bias. Administering the questionnaire by e-mail introduced two possible limitations. To guarantee anonymity the participants were asked to place their answers in a box at the intern curator's office. However due to logistical factors, most chose to reply via e-mail, thus effectively compromising their anonymity. Participants were asked to answer without the use of textbooks or other resources, but this could not be guaranteed. The second-year interns who responded may have benefited from writing the same test two years earlier. However, on analysing the results, there was no significant difference in the results of this group (57.9%) compared to the overall group average of 56.8%. Our study shows that the majority of newly qualified South African doctors do not have a basic level of competence in musculoskeletal medicine. This is alarming, not only because of the high prevalence of musculoskeletal conditions, but also because a large number of interns, Community Service Officers and Medical Officers in South Africa work in areas without specialist support. It is a major challenge to identify and quantify the specific factors which contribute towards the poor performance of our medical graduates. Factors such as curricular content, time allocation, teaching methods and teacher skills are all likely to contribute. Williams, from the University Hospitals of Leicester, showed a 6% improvement in performance by undergraduate students when the orthopaedic surgery component of their training was increased by just one week.21 Interestingly, they also showed the quality of education received in a given subspecialty may influence the choice of an undergraduate student's career.22 This association between increased time in a discipline and improved competency is apparent. However, given the vast and ever-expanding scope of modern medicine, and the curricular demands imposed by other disciplines/sub-specialties on curriculum time, simply demanding an increased allotment of time is not a realistic solution to the problem. Alternative ways to increase total contact time must be explored. These include on-call duties shadowing an orthopaedic registrar, participation in primary-care outreach programmes and structured elective blocks, and more effective self-directed learning programmes. Most orthopaedic departments have well-established primary-care outreach programmes. Including students in these programmes may be an effective method of exposing them to the common musculoskeletal conditions they will encounter after graduating. The Parallel Rural Clinical Curriculum (PRCC) at Flinders University School of Medicine in South Australia rotates medical students through rural hospitals for a year (their pre-final year).23 The students reported numerous benefits, including exposure to a broad range of patient presentations, continuity of care, mentorship, increased responsibility in the care of patients, and better performance in the exit examination. More focused teaching of the basic sciences may also make time available for the teaching of the clinical skills so lacking in musculoskeletal medicine. Several studies have shown that undergraduate training is frequently not directly relevant to the skills required for management of musculoskeletal conditions in a general outpatient setting. Rural rotations, such as the PRCC at Flinders University, have been shown to address this bias toward tertiary medicine. Interestingly these findings are far from new. Abraham Flexner, regarded as the first medical educationalist, advised over a century ago that medical training should be 'marked by small classes, personal attention and hands-on teaching'. He believed lectures allowed medical schools to 'handle cheaply by wholesale a large body of students that would otherwise be unmanageable and thus give the lecturer time for research'.26 Flexner's latter comment brings up another important point. Specialists working in the state have numerous commitments outside of their clinical work, including research, fellowship programmes, postgraduate education and private practice commitments. These trends may well mean registrars are becoming increasingly more responsible for undergraduate training. They in turn are often new to student supervision and lack the appropriate training. Archer from Stellenbosch University found a short course in undergraduate clinical supervision improved interaction with students and provided supervisors with previously unused teaching strategies.27 The participants 'emphasised that the faculty has an obligation to provide opportunities for clinical supervisors to improve their skills to supervise students and to better understand adult learning'. The Bone and Joint Decade Undergraduate Curriculum Development Group published recommendations for a musculoskeletal undergraduate curriculum in 2004.28 The recommendations set global standards for the minimum level of competence in managing patients with musculoskeletal problems, regardless of further specialisation. The focus of their recommendations was on the skills required to diagnose a person with a musculoskeletal problem. As it is a basic skill, they recommend that the musculoskeletal examination be taught early in the curriculum along with the other organ systems. Their second recommendation was the competency to assess urgent problems of the musculoskeletal system. Emergencies may not be common, but it is essential to recognise them and to manage them appropriately. In our study, while the 'red flag' group of questions was answered better than the average (average score of 55.3% compared to the overall average score of 45.3%) this was not reassuring, as only half the candidates knew to look for a vascular injury in a patient with a dislocated knee, and only 13% knew the basic management of an open fracture. In addition, only 6% of the study group considered both tumour and infection in someone with lower back pain that woke them from sleep (Figure 1). Bilderback et al. 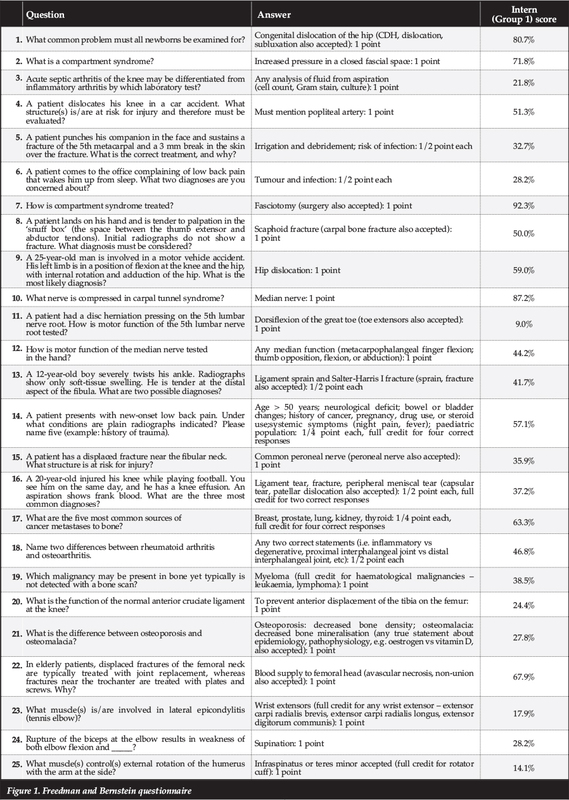 from Louisiana State University designed a six-week course in musculoskeletal medicine and used Freedman and Bernstein's examination to assess its efficacy.29 A look at the principles of their curriculum illustrates possible solutions to deficiencies in our musculoskeletal education. Most significantly they believed that medical education would be improved if clinical instruction began during the pre-clinical years. The main features of their course were the use of small groups of no more than five students to focus on the physical examination, and basic-science teaching which was directly related to clinical practice. Faculty from the departments of orthopaedic surgery, anatomy and rheumatology designed the course. The aim was to provide an adequate foundation of primary-care knowledge of the musculoskeletal system. The clinical lectures were directly preceded by relevant anatomy lectures and dissections to provide a context for the clinical information. Self-learning was facilitated by placing lecture material on a course website, which the students were encouraged to study before class. Attendance at lectures was not mandatory, but students who missed no more than two lectures were given a bonus in the final examination. The course directors identified the material that they judged essential and then recruited basic-science experts in those areas to teach it. This contrasts with the old style where the basic scientist decides the content of the pre-clinical curriculum. In a short period, they showed a 20% improvement in the Freedman and Bernstein examination. At the University of Cape Town, the orthopaedics department has started using the methods described at Louisiana State University to restructure their undergraduate training programme. Orthopaedics is currently taught in fifth year over a four-week block which is shared with both Anaesthetics and Trauma. Teaching the entire curriculum within these time constraints is challenging, and to increase exposure to important musculoskeletal emergencies, students are now rostered into on-call duties and weekend rounds with the attending registrar. They have also started rotating through the paediatric orthopaedic department to gain exposure to this important aspect of musculoskeletal medicine, and are required to complete a detailed logbook of cases and procedures which they have witnessed or performed to ensure they are gaining appropriate exposure. Students who are interested have also been integrated into research projects currently being run within the department. Because of the limited teaching time available, self-directed learning has been prioritised by upgrading online resources. A series of standardised examination technique videos have been created and are loaded, together with other core topics, onto tablets which the students keep for the duration of the block. Students also meet once a week to provide feedback to the Head of Department, and teachers are now more accountable, as all consultants and registrars are scored by the students at the end of each four-week block. The Department of Orthopaedics is working together with the Department of Anatomy to establish a programme where musculoskeletal anatomy is taught together with the examination of the musculoskeletal system so that a clinical context is provided for their dissection. This strategy will also serve the purpose of establishing earlier clinical contact so that the examination of the musculoskeletal system can be learnt early, revised, and consolidated over years rather than it being an afterthought, taught near the end of the clinical programme. It has been negotiated that from 2014, the allocated four-week block will be shared only with Trauma, and no longer Anaesthetics. Undergraduate training in musculoskeletal medicine is inadequate in South Africa, and internship programmes do not compensate for this lack. The delivery of musculoskeletal care is not the exclusive domain of the orthopaedic surgeon and is provided largely by other practitioners. Competency in musculoskeletal medicine must therefore be a requirement before graduating, regardless of further specialisation. Ultimately we as the orthopaedic teaching community are responsible for ensuring that we train competent and skilled doctors who will go out into our community and practice good, safe medicine. Statistical analysis by Mr H Carrara, Analytical Epidemiologist/Biostatistician, School of Public Health and Family Medicine, UCT. No benefits of any form have been or are to be received from a commercial party related directly or indirectly to the subject of the article.